After coming off a tough loss to the Montreal Canadiens on Saturday, the New York Rangers went back to work to take on the Minnesota Wild. The Wild came into this game with a 4-2 record to start the season. The Rangers got off to an ugly start as Chris Kreider was called for boarding and a game misconduct. They lost John Moore in the second period with a match penalty. The Wild, however, could not convert on any of their power play chances, as the Rangers PK unit came up huge. The Wild scored three straight goals in the second period to take a 3-0 lead. Nate Prosser, Matt Cooke, and Jason Pominville scored to silence the Garden crowd. No one expected what was going to take place in the 3rd period. The Rangers got on the board with a goal from defenseman Kevin Klein. This was Klein’s second goal in three games. Less then two minutes later, Rick Nash scored his 9th goal of the season to cut the Wild’s lead to 3-2. Momentum seemed to have changed when Jason Zucker scored 47 seconds later to put the Wild up 4-2. Even though the Rangers were down they never gave up. Derrick Brassard scored his 4th goal of the season to cut the Wilds lead to one, again. Anthony Duclair, who has struggled this season, tied the game at 4 with his 1st career NHL goal. 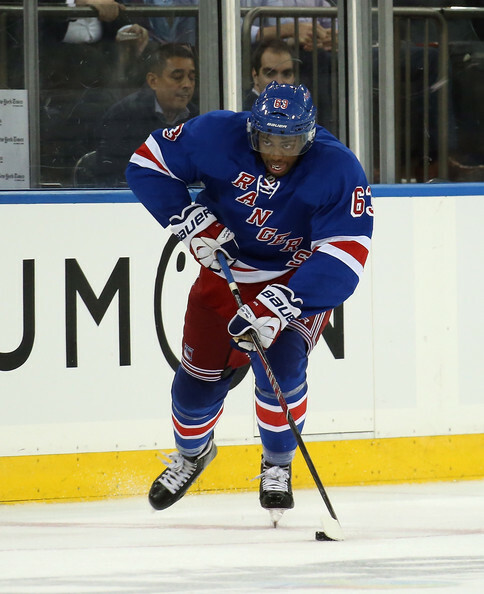 The Garden crowd was alive and loud and so were the players who celebrated with Duclair. The Garden got even louder when Mats Zuccarello scored his 1st goal of the season to give the Rangers a 5-4 lead and the win. The Rangers had their second miraculous win in less than a week as this team continues their “never say die” attitude. The Rangers won’t play until Saturday as they host the Winnipeg Jets at Madison Square Garden. The puck hits the ice at 7pm.